ADDIS ABABA, May 10 2013 (IPS) - Several Ethiopian publications are coming together to set up a ‘press council’ with the hope of easing restrictions on the media in Ethiopia. The journalists suggested the idea of the council at a May 3 meeting held at the behest of the Ministry of Information to discuss media reforms in the country. The press council will be formed by editors of government and independent publications. The purpose of the council is to hold discussions about press restrictions and foster direct and frequent dialogue with the government over such issues. Worku said there were still many obstacles for the press to operate freely in Ethiopia. He said, for example, that he could not use government printing houses and was forced to use private companies to print his newspaper. Since he launched his publication, Worku said, the authorities have frequently visited his office demanding information regarding his accounts, and he hopes that the meeting and the new council will be able to reduce some of these obstacles. Despite the government’s promises, some journalists are less hopeful it will bring about any change. Independent journalist Anania Sorri told IPS he believed that the government agreed to the meeting and council merely to distract the media from aspirations for real change. Sorri’s close friend Reeyot Alemu, winner of this year’s World Press Freedom Prize, is in prison. She was initially sentenced to 14 years after being found guilty of planning terrorist attacks, laundering money and working with terrorist organisations. On appeal, two charges were dropped and her sentence was reduced to five years. Sorri told IPS that Alemu has health complications, including a breast tumour, gastritis, and sinusitis. And recently, prison officials threatened her with solitary confinement if she leaked information about prison conditions to visitors. 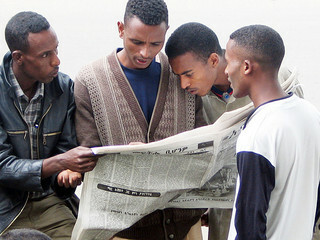 International organisations have long criticised the Ethiopian government for its treatment of the independent media. The Committee to Protect Journalists reports that seven journalists are currently in detention in Ethiopia, and that more reporters have fled Ethiopia than any other country, putting the total at 79 between August 2001 and May 2011. In response to critics, the government has accused many of the journalists it imprisons of crossing a line between journalism and illegal activities. State officials have accused critics of over-simplifying things and failing to understand the real situation on the ground. One of the most controversial cases is that of prominent blogger and government critic Eskinder Nega. Just last week his appeal was rejected and his 18-year sentence was upheld. Nega was arrested in September 2011 and charged with plotting an Arab Spring revolution through his writings and a speech he gave at a conference organised by opposition groups. Just before his arrest he had published a piece calling for the government to respect freedom of assembly and to end torture in prisons. “Because there is no judicial independence, no justice can be found in the courts in politically motivated prosecutions, as shown by the recent Supreme Court decision to uphold an 18-year sentence for Eskinder Nega,” Leslie Lefkow, Ethiopia expert at Human Rights Watch, told IPS. However, in the case of Nega, one local analyst said he deserved to be punished as he had incited violence and created ethnic tensions in the past. Daniel Berhane, a prominent Ethiopian blogger, told IPS that journalists like Nega were aligned with political parties. Local journalists say that before widespread anti-government protests following the 2005 national elections, the media climate was free. After the protests, though, the government clamped down on independent media publications as well as civil society groups and any opposition. Then the government introduced anti-terrorism laws, which have been used to charge journalists who have had any contact with opposition groups or journalists in exile, who according to the government have ties with terrorist outfits. Several Muslim journalists have also been charged under the anti-terrorism law, after reporting on Muslim protests early this year. Also, newspapers aligned with opposition groups have repeatedly been shut down as the government pressures publishing houses not to print their papers, opposition politicians told IPS. After the recent meeting with the government about the future press council, attendees told IPS that the government officials said they were tired of arresting media representatives – giving cause for hope that the situation might soon change. But while journalists try to form the press council and hope the meeting will ease many of the restrictions, it appears the situation remains far from ideal, as journalists remain behind bars and independent reporters face myriad difficulties.